Warrington To Kid Galahad: Do You Fancy Me or Something? 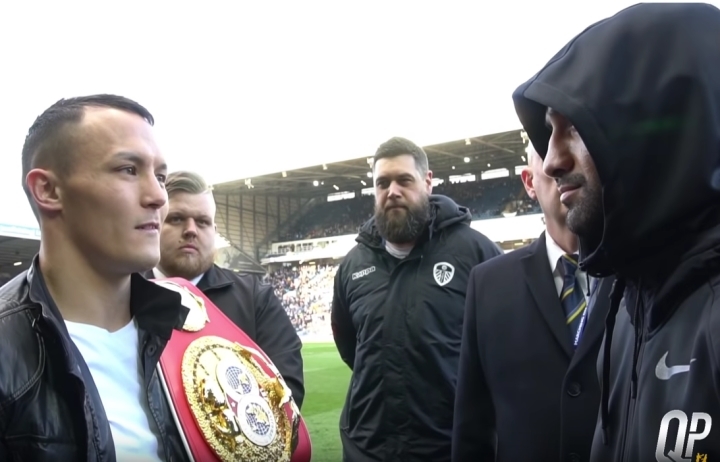 During half time of yesterday's Leeds United v Sheffield Wednesday game, the unbeaten Leeds and Sheffield featherweights came face to face for the first time since the press conference to announce their fight back in March. He said: “Do you fancy me or something? You can't take your eyes off me!" as Galahad refused to break his gaze. As the thousands of fans in attendance began chanting that Warrington should knock Galahad out, Warrington continued to goad Galahad and warned "On June 15th they will get their wish!" This might be a clash of styles. Kid peds has an awkward style and I wouldn’t be shocked if he wins this. This is first fight of galahad I've seen after being busted for peds. Let's see if he can fight without em?